Hi friends! Over the past couple of weeks I’ve been sharing coloring pages from the soon-to-be-launched Tiny Buddha’s Worry Journal, which also includes doodle prompts, writing prompts, and questions to help you minimize anxiety in your daily life. So far I’ve shared the music coloring page and the meditation coloring page. Today’s page is one of my favorites. The tip: hug someone to release the feel-good chemical oxytocin (a hormone that some have called an “antidote to depressive feelings”). As someone who works alone, I can sometimes feel a little starved for connection during my day—which is ironic, since I connect with so many people online. But you can’t look into someone’s eyes in a comment. You can’t hear their heartbeat in an email. And you can’t touch their hand in a Facebook exchange. Whenever I’ve had a tough day, it’s tempting to want to talk it all out—more thoughts, more words, more analysis. And sometimes, this helps. But more often than not, I just need a hug. I just need to feel close to someone I love and to melt into their arms. Sure, it feels great to be heard. But sometimes I just need to be held so I can remind myself what it feels like to let go. We all need this sometimes. We all need this connection, this comfort, this release. Everything seems easier when we feel supported, and everything feels more manageable when we remember we’re not alone. Hug someone today. Put down your phone, reach out your arms, and feel their heartbeat. It could help you more than you think, and the person you give it to could need it more than you know. Lori Deschene is the founder of Tiny Buddha and Recreate Your Life Story, an online course that helps you let go of the past and live a life you love. Her latest book, Tiny Buddha’s Worry Journal, which includes 15 coloring pages, is now available for pre-order. For daily wisdom, follow Tiny Buddha on Twitter, Facebook & Instagram. 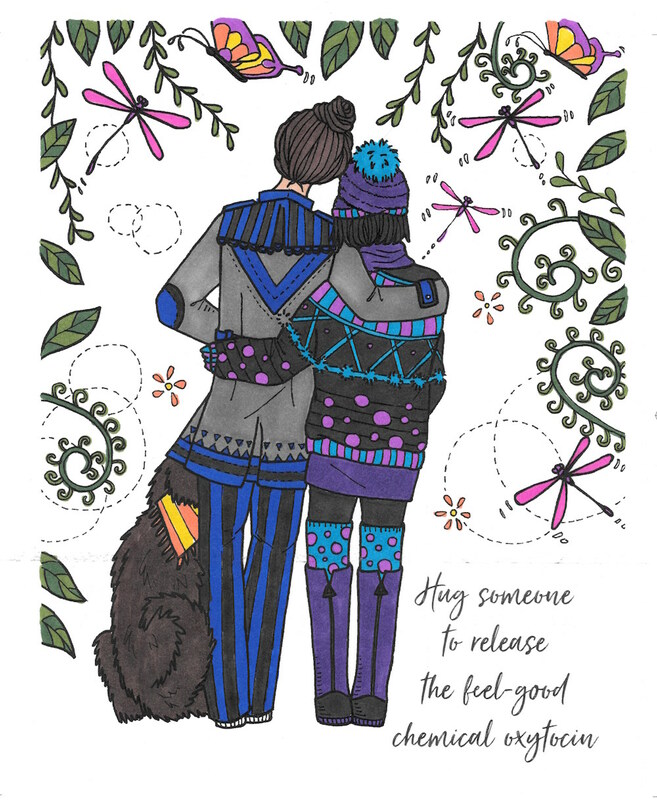 The post Hugging Coloring Page from Tiny Buddha’s Worry Journal appeared first on Tiny Buddha.